Imagine snuggling under your favorite blanket and a surprise dog licks your face. Imagine living with the Gundersons from Fargo in a world with no murder. Imagine if you got to eat meatloaf homemade from the flesh of Charlie Brown. These are my best stabs at describing what it’s like to watch Joe Pera do comedy. Suffice it to say: it’s hard to explain. If it helps to know that Pera is an Andy Kaufman Award winner, and the sensitive old-man persona is nothing short of completely genuine, well, good. I’m glad to have helped. Pera’s various projects for Adult Swim, including the animated Joe Pera Talks You to Sleep and the live-action Joe Pera Helps You Find the Perfect Christmas Tree, also serve as brilliant counter-programming for the channel’s signature, aggressive style. And yet, they fit right in. It’s just a completely different kind of absurdity, one borne from gentle, kind intentions (“We just tried to focus on talking them to sleep and making a relaxing show for before bed,” said Pera, when I asked him how he’d describe Talks You to Sleep’s operating conceit). Pera’s first series, Joe Pera Talks With You, is a spiritual sequel to his previous Adult Swim specials, and communicates that same serene loneliness. “Each one has kind of served as development for the next one,” Pera says. “They’re definitely doing different things, but the series is definitely another step.” With the Christmas Tree special serving as a kind-of backdoor pilot, each episode of Talks With You grows a new story from one of Joe’s tutorials (i.e. 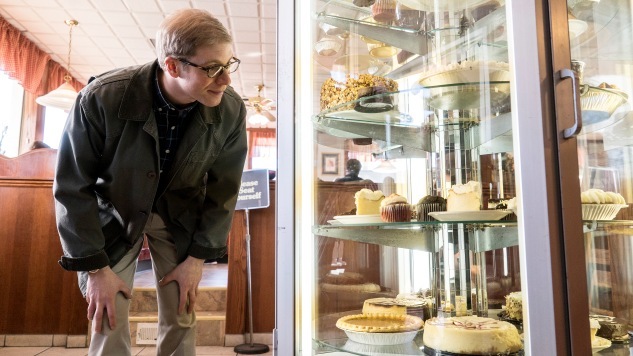 “Joe Pera Takes You to Breakfast,” “Joe Pera Shows You How to Dance,” “Joe Pera Takes You for a Fall Drive”), using them to give viewers a glimpse into the fictional Joe’s still-waters-run-deep life in the Upper Peninsula of Michigan. The other essential piece of the puzzle is Pera’s counter programming to the counter programming: his (regular) collaborators Jo Firestone (The Tonight Show) and Conner O’Malley (Late Night with Seth Meyers), who write on Talks With You in addition to rounding out the cast. “I think our stuff works because we’re kind of similar,” says Pera of Firestone, “and Conner and I work together because we’re—at least performance-wise—we’re pretty different in the ways that we approach it,” which is pretty on point. Firestone and Pera share a soft-spoken delivery, though Firestone plays significantly more self-aware in comparison with Pera’s frequent naiveté. O’Malley and Pera, on the other hand, are a perfect example of opposites attracting (consider their fantastic web series How to Make It In USA, which should corroborate Pera’s loving assessment of his friend: “kinda… aggressive?”). O’Malley might be the only one of the three who’s actually from the Midwest, but they all share a sensibility that feels Midwestern—“I get along with them well for that reason,” says Pera. Together they find something that is almost completely missing from the American cultural landscape: an honest celebration of small-town life that gets nowhere near any regressive MAGA politics. And the sheer, unpretentious decency of Joe Pera Talks With You can be captured pretty perfectly by the end of my interview with Pera, who hopped back in as we were wrapping up over the phone. Pera took a long pause. A thoughtful pause.